Kim Kardashian and Beyonce Join Forces, Bury Feud: Vow To Keep Rihanna Away From Kanye West and Jay-Z! The rivalry between Beyonce and Kim Kardashian has been the stuff of pop-culture legends for years. But now, according to rumors, the R&B diva and reality TV Queen have officially buried the hatchet in an effort to take down a mutual enemy: Rihanna. It’s no secret that there is no love lost between Beyonce and Kim Kardashian. The only thing scarier than being caught between the two warring divas is to be on the receiving end of their mutual hatred. At this time, both of their hubbies are sleeping in their diamond encrusted dog houses because of their relationships with Rihanna. The latest edition of In Touch Magazine reveals that Beyonce and Jay-Z got in a heated feud at a restaurant over his extremely personal business relationship with singer Rihanna. And, Kanye West is in the same boat. Ironically, this week, OK! Magazine is reporting that Kim Kardashian is not happy with her hubby after his overly-flirtatious performance with Rihanna at a Super Bowl party, and is feeling pretty insecure about Kanye and Rihanna’s connection. Wow, Rihanna has been a busy girl in 2015. We’re not even three months in – and she has already nearly wrecked not one but two faux-happy homes. 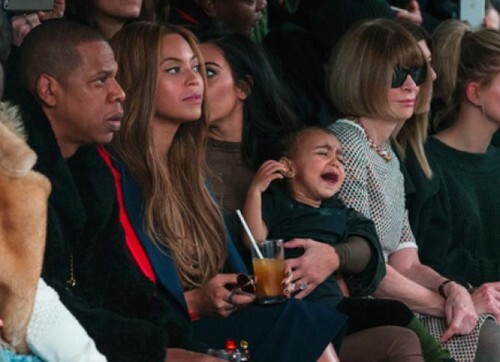 Beyonce and Kim Kardashian refuse to give up their thrones though. And, according to one of CDL’s insiders, the two divas are burying the proverbial hatchet and joining forces to keep Rihanna away from their husbands. Sadly, Rihanna could probably care less about Kim or Beyonce, and considering her track record, Kanye and Jay-Z are not even on her radar. And she was just romantically linked to Leonardo DiCaprio. Do you think Kim and Beyonce are paranoid and insecure? Or should they really be considered about their husbands and Rihanna? Let us know what you think in the comment section below!